仮想コア ベースの購入モデルでの General Purpose サービス レベルは、DTU ベースの購入モデルでは Standard サービス レベルと呼ばれます。The general purpose service tier in the vCore-based purchasing model is called the standard service tier in the DTU-based purchasing model. 仮想コアベースの購入モデルと DTU ベースの購入モデルとの比較については、Azure SQL Database の購入モデルとリソースに関する記事をご覧ください。For a comparison of the vCore-based purchasing model with the DTU-based purchasing model, see Azure SQL Database purchasing models and resources. General Purpose サービス レベルのアーキテクチャ モデルは、コンピューティングとストレージの分離に基づきます。The architectural model for the general purpose service tier is based on a separation of compute and storage. このアーキテクチャ モデルでは、データベース ファイルが透過的にレプリケートされ、基盤となるインフラストラクチャの障害が発生した場合にデータ損失が発生しないことが保証されている Azure Blob Storage の高可用性と信頼性に依存しています。This architectural model relies on high availability and reliability of Azure Blob storage that transparently replicates database files and guarantees no data loss if underlying infrastructure failure happens. 次の図は、計算レイヤーとストレージ レイヤーが分離されている Standard アーキテクチャ モデルの 4 ノードを示しています。The following figure shows four nodes in standard architectural model with the separated compute and storage layers. ステートレス計算レイヤー。sqlserver.exe プロセスを実行しており、一時的なデータとキャッシュ データのみが含まれています (プラン キャッシュ、バッファー プール、列のストア プールなど)。A stateless compute layer that is running the sqlserver.exe process and contains only transient and cached data (for example – plan cache, buffer pool, column store pool). このステートレス SQL Server ノードは、プロセスの初期化、ノードの正常性の制御、および他の場所へのフェールオーバーを必要に応じて実行する Azure Service Fabric によって操作されます。This stateless SQL Server node is operated by Azure Service Fabric that initializes process, controls health of the node, and performs failover to another place if necessary. ステートフル データ レイヤー。データベース ファイル (.mdf/.ldf) は Azure Blob Storage に保存されています。A stateful data layer with database files (.mdf/.ldf) that are stored in Azure Blob storage. 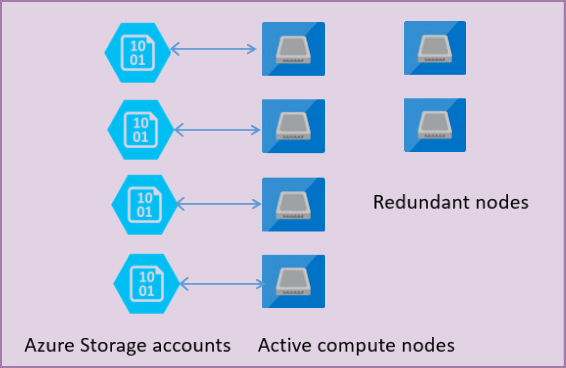 Azure Blob Storage では、データベース ファイル内にあるレコードのデータが消失しないことが保証されています。Azure Blob storage guarantees that there will be no data loss of any record that is placed in any database file. Azure Storage には、データの可用性と冗長性が組み込まれています。そのため、たとえ SQL Server プロセスがクラッシュしても、ログ ファイルのレコードやデータ ファイルのページはすべて維持されます。Azure Storage has built-in data availability/redundancy that ensures that every record in log file or page in data file will be preserved even if SQL Server process crashes. データベース エンジンまたはオペレーティング システムがアップグレードされた場合、基となるインフラストラクチャの一部で障害が発生した場合、または SQL Server プロセスで重大な問題が検出された場合、Azure Service Fabric は、ステートレス SQL Server プロセスを別のステートレス計算ノードに移行します。Whenever database engine or operating system is upgraded, some part of underlying infrastructure fails, or if some critical issue is detected in SQL Server process, Azure Service Fabric will move the stateless SQL Server process to another stateless compute node. フェールオーバー時間を最小限に抑えるために、プライマリ ノードのフェールオーバーが発生した場合に新しい計算サービスの実行を待機している一連のスペア ノードがあります。There is a set of spare nodes that is waiting to run new compute service if a failover of the primary node happens in order to minimize failover time. Azure Storage レイヤーのデータは影響を受けず、データ/ログ ファイルは、新しく初期化された SQL Server プロセスにアタッチされます。Data in Azure storage layer is not affected, and data/log files are attached to newly initialized SQL Server process. このプロセスは、99.99% の可用性を保証していますが、移行時間や、新しい SQL Server ノードの起動にコールド キャッシュを使用することが原因で、実行中の大きなワークロードに対しては、パフォーマンス上の影響が若干生じる場合があります。This process guarantees 99.99% availability, but it might have some performance impacts on heavy workload that is running due to transition time and the fact the new SQL Server node starts with cold cache. General Purpose サービス レベルは、ほとんどの一般的なワークロード向けに設計されている Azure SQL Database の既定のサービス レベルです。General Purpose service tier is a default service tier in Azure SQL Database that is designed for most of the generic workloads. ほとんどのケースで、Azure SQL IaaS に匹敵する、ストレージ待機時間が 5 から 10 ミリ秒で SLA が 99.99% のフル マネージド データベース エンジンが必要な場合は、General Purpose レベルをお勧めします。If you need a fully managed database engine with 99.99% SLA with storage latency between 5 and 10 ms that matches Azure SQL IaaS in most of the cases, General Purpose tier is the option for you. Business Critical レベルと Hyperscale レベルについて学びます。Learn about Business Critical and Hyperscale tiers.